Are you wanting to complete some renovation work on your garden but the current soil isn’t providing the right level of nutrients for the greenery you are planting? Then you need some high-quality topsoil. Southampton homeowners will transform their gardens into luxurious green spaces with our Abbey Turf topsoil Southampton services. Topsoil is the name given to the uppermost layer of soil, and it is used to aid the growth of plants and grass. Southampton topsoil is perfect for helping your garden’s development as it is full of nutrients and organic substances. By adding topsoil to the outdoor space of your property, you will be able to plant new seeds, create new borders and beds, and also be able to establish a solid base for laying new turf. To find out more about our topsoil in Southampton, have a read on below. What can Abbey Turf do for you? There are three different types of topsoil products in Southampton available to choose from; depending on what use you require your topsoil for will determine the grade quality that you should select. The three different types of topsoil Southampton gardens will benefit from are called premium grade, general-purpose grade, and economy grade. 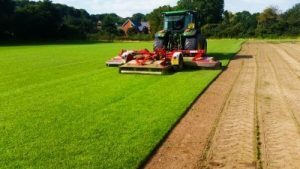 Each topsoil Southampton option has its benefits, but if you are unsure which type of topsoil is best for the job, speak to a member of Abbey Turf, and we will supply you with unbiased information. All of the topsoil Southampton property owners will receive is thoroughly screened to make sure it contains no weeds or naturally occurring objects that could harm the growth of your new turf or plants. What are the benefits of using topsoil for your gardening project? When it comes to nature, the survival of an ecosystem relies on maintaining a delicate balance. The destruction or removal of Southampton topsoil, for instance, can seriously impact the nutrient content of the soil becoming unsuitable for supporting plant growth. Without healthy plant growth and complex root systems, further soil erosion will occur. By choosing our topsoil in Southampton, you’ll ensure that a healthy balance is maintained all year round. Where topsoil in Southampton is absent, it can be incredibly difficult for all but the hardiest of species such as weeds to grow. Areas used for conventional farming are particularly reliant on the presence of topsoil. The soil stocked by our Southampton topsoil company is of the finest quality. When introduced it can provide a nutrient rich environment that will encourage healthy plant growth and strong root development. Topsoil can help transform even the harshest environment where clay may be present in the subsoil. As mentioned above, the presence of topsoil in Southampton gardens will lead to healthier plant growth and stronger root structures. This is due to topsoil’s greater capacity for nutrient retention when compared with subsoil. As plant and animal matter decays, water and gases are carried down into the porous topsoil where nematodes assist in creating soil aggregates. It is these aggregates that are responsible for promoting healthy growth. Why choose our topsoil Southampton supplier? When you decide to renovate your garden, you need to make sure that you opt for the best-suited soil to achieve the desired results. If you pick the wrong soil, there is a high chance that any gardening products you add on top of the soil will get washed away in the rain or the plants will not receive the right level of nutrients to make sure they grow well. At Abbey Turf, we have over 20 years’ experience in supplying topsoil Southampton homeowners can use to transform their homes. All of the topsoil Southampton products that we create and supply at Abbey Turf are fully compliant with British Standards, and our company is completely trusted by Local Authorities and Government bodies. To see how our Abbey Turf horticulturalists have transformed Southampton properties through the installation of topsoil, turf and other gardening products, view our gallery. We will transform your garden from something that is uninspiring into a space that is the envy of all your neighbours! For all your landscaping and topsoil Southampton deliveries requirements, speak to the most qualified horticulturalists in the business and call Abbey Turf. Organise a site visit today by calling 02380 812302 and our team will work with you to convert your garden into a space you will love.